What would we know about cigarettes and health if they were as new as e-cigarettes? The question in the title (h/t to Rolygate for posing it to me) is intriguing. If cigarettes had been used for less than a decade, and had seen the rate of uptake that e-cigarettes have seen, how much would we know about their health effects right now, and how does that compare to what we know about e-cigarettes? For purposes of this exercise, assume that we have current general epidemiology knowledge and methods (ex knowledge about cigarettes per se, of course). That is more complicated a counterfactual than you might realize because of how entangled the early history of epidemiology was with research on cigarettes. However, even if semi-modern methods got a later start, epidemiology has evolved so ridiculously slowly that it is not unreasonable to assume we could have about the same level of development. We would have to assume that there would not be a tobacco control industry and the associated enormous pools of money from taxes on smokers. This would improve the accuracy of what information we did have, but would mean that there were not billions of dollars looking for something to do, so there would be a lot less research (perhaps even compared to what has been done on e-cigarettes in reality, in spite of the obvious difference in its value). I will also make the absurd assumption that despite how easy and appealing it is to smoke tobacco in some form (it has been happening since before recorded history in the Americas, after all), that there is no history of chain-smoking pipes or anything similar that would have provided a lot of the same data we have about cigarettes. So what would we know? It is safe to assume we would know that smoking causes acute negative effects for the lungs and cardiovascular system. These are easy to observe and many would have been noticed by smokers. There would probably have been some formal studies in addition to the general observations. We would probably have a pretty good catalog of these effects already, though would not know all of them. For example, the vascular tissue damage caused by circulating smoke particles might not have been detected, given that it is only now starting to be understood. This contrasts with what we know about the acute negative effects of e-cigarettes in several ways. First, e-cigarettes cause no easily observed, relatively common serious consequences. There has been ample opportunity to observe these so we can safely conclude they do not exist. (And this is obviously not changed by the fact that the ANTZ have tried to trump up such claims — e.g., the lies about there being lung effects similar to cigarettes, but that are really just similar to breathing in very humid air.) On the other hand, in the cigarette scenario we would probably have the (scientific) advantage of observing people transitioning from abstinence to smoking, whereas for e-cigarettes we only observe the transition from smoking to vaping. Thus, it might be that some of the acute effects from smoking still exist when someone switches to e-cigarettes but are hidden because switching still dramatically reduces them. If cigarettes were less than a decade old, we would know very little about the cancer risk. Very few already-detectable cancers would have been caused. We would probably guess that they cause cancer based on chemistry and analogy to other smoke exposures. On the other hand, so much of what we know about those analogies exists because of research on smoking, so the opportunity to learn from analogy would probably be greatly reduced. Similarly, the epidemiology does not tell us anything about the cancer risk from e-cigarettes. The assessment that there is very little, if any, cancer risk from them is based on the chemistry of the exposure and how that compares to other known exposures. The picture for non-acute cardiovascular effects is rather more complicated. Some of the risk pathways for smoking have rapid enough impacts that it is possible they could have been detected in the epidemiology already if researchers had really moved fast to gather data. Some of the risk pathways are more like cancer, taking so long to have an impact that we would not have seen them yet. But some are as short as harvesting effects (smoking immediately triggering heart attacks or strokes in people who were on the verge of having them within months), and so have even been measured if the right research was done. [*] Also, without a tobacco control industry, there is a much better chance that any such research would have been done honestly. For e-cigarettes we have no such data and have little chance of getting anything useful for a very long time, if ever. Once again, our knowledge of the exposure and analogy tell us that any such risk from e-cigarettes is going to be small. Even if we had epidemiologic data on vapers right now (which we do not) it would be impossible to detect any effect from e-cigarettes given the larger effect that the years of smoking before using e-cigarettes had. When the day comes that there are a lot of e-cigarette users who were never smokers, we could theoretically detect long-term cardiovascular risk, if it exists. But realistically, any such risk is probably small enough that it would be below the limit of detection; the confounding would swamp it. We have observed this in the experience of smokeless tobacco, where any cardiovascular risks is too small to detect given the confounding, and since these risks are probably basically the same for e-cigarettes or smokeless tobacco we have pretty good evidence they are below the threshold of detection. In sum, if cigarettes were as new as e-cigarettes are, we would already have some observations about them being quite bad for you. We would probably have enough knowledge from all source to make estimates of the total risk, and if done realistically the range of uncertainty would cover the true value (perhaps better than the current claims do!). Still, we might well underestimate the cancer risk since we never would have seen an everyday exposure that caused quite so much cancer. Still, concluding that frequently inhaling a concentrated smoke is quite bad for you would not require an appeal to ignorance. This contrasts sharply with what we know about e-cigarettes or what we would know about smokeless tobacco if somehow it had recently appeared (an even more difficult scenario to imagine). In the real world, we know that the acute negative effects are trivial and have no affirmative reason to believe there is any substantial risk. Thus, anti-e-cigarette activism leaps immediately to an appeal to ignorance — “we do not know for sure…” — the logic of which is that we should never allow people to do anything that they have not already been doing for decades. As an aside, it is interesting extend this counterfactual analysis to analyze one of the many thought-free mantras of the tobacco control industry: “if cigarettes were invented today, they would be banned.” This actually seems quite unlikely to be true. If a rapid ban did happen in the hypothetical world, it would would not be because of the true risks, but rather would be driven by a Drug War mentality — the inclination to ban any drug people like because people should not be allowed to use drugs. After all, absent the tobacco control industry, who else other than the drug warriors would be calling for a ban? The perversion of public health (an effort to help people) into “public health” (an effort to control people) was caused by the tobacco control industry. Indeed, absent the tobacco control industry, it is not clear that the Drug War would have much traction on “soft” drugs at all. Even within the counterfactual, it is difficult to imagine that smokeless tobacco not being widely used when cigarettes were “invented” in the 2000s, just as similar everyday drugs are used in almost every culture. Though switching to smoking from it would be an unfortunate choice, it is not clear it would trigger a Drug War type reaction. For those who may not know, the World Health Organization is one of the worst anti-THR liars in the world. The prominence of their role as liars has fallen behind some other players in the Anglophone discourse recently, perhaps because their FCTC process has been largely eclipsed by the FDA, MHRA, and EU processes, because the WHO are slow and plodding so have not managed to become very actively anti-ecig yet. But they, including their propaganda-science unit, the International Agency for Research on Cancer (IARC), are still trying to keep people smoking. In this press release (h/t Clive Bates), WHO claims smokeless tobacco causes a huge number of cases of oral cancer and creates a huge health and financial toll in India and other countries in that region. The announcement includes the news that the governments in that region are embarking on a goal (note: I intentionally did not say “plan”) to reduce use by 30%. For those who do not know, this really means that WHO set that goal — in this region and in many other poor countries, insult is added to poverty by having a bunch of rich operatives in Geneva act as puppet masters for the national health authorities. The lie here is that people in that region don’t use smokeless tobacco. The cheap and ubiquitous causal drugs (filling the same niche that coffee, tea, tobacco, coca, etc. do in other cultures) used by millions of people in that region consist of several ingredients. Sometimes tobacco is one of them, though sometimes not. When it is included, it is typically the third ingredient down the list. Suggesting that tobacco is causing these diseases is basically like claiming that tomato slices are fattening: Tomato slices are typically the third ingredient in a fast-food burger, after the meat (including the grease it is cooked in) and the bun/wheat flour. Fast food burgers are fattening. So blame the tomatoes! They are from a plant that is closely related to tobacco, after all, which means it must be their fault. So if you are buying something in the gutka family in India be sure to get the kind without tobacco, and if you eat fast food burgers be sure to hold the tomato. According to the WHO, that will make the products healthy. Yesterday I explained why the new clinical trial out of New Zealand should not be touted as important news for e-cigarettes or THR in general. In addition to the general message that clinical cessation trials are not the right way to study THR products and are just as likely to produce bad results as “good” ones, I pointed out a few particular issues. First, it was damningly faint praise, claiming that e-cigarettes perform just barely better than nicotine patches, which grossly misrepresents everything we know about their effectiveness. Additionally, with a plausible different level of luck (random sampling error) that study would have “shown” that e-cigarettes are less effective than patches. Of course, such a result would have been no more informative about e-cigarettes than the “good” result was, but that is the point. found no difference in 6 month quit rates among the three groups. 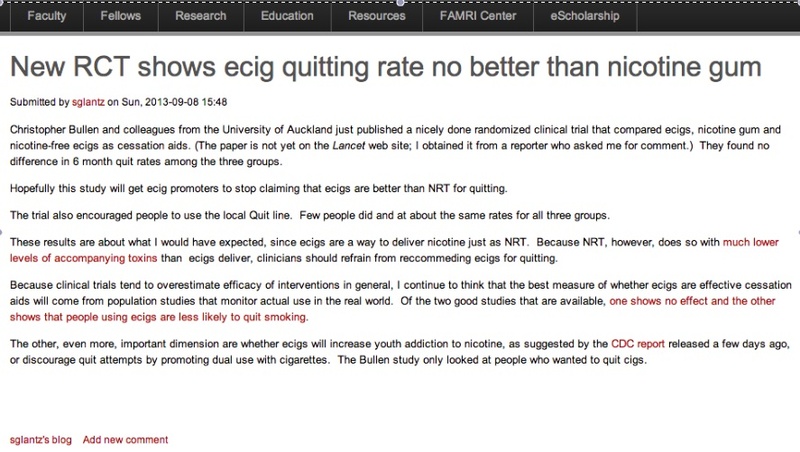 Hopefully this study will get ecig promoters to stop claiming that ecigs are better than NRT for quitting. Of course, the study showed that e-cigarettes did a bit better. Glantz probably thinks this bald lie is justified by a common misinterpretation of statistics, wherein different numbers that are not statistically significantly different are incorrectly called “the same”. Anyone with a 21st century understanding of epidemiology knows that this is not the right thing to say, but since Glantz’s paltry understanding of the science seems to be based on two classes he took three decades ago, perhaps this is simple innumeracy and not a lie. Still, he has a point about the numbers not being very dramatic. The real lie (and a case of innumeracy much worse than using incorrect terminology) is suggesting that this one little flawed artificial study somehow trumps the vast knowledge we have from better sources. It is quite funny that he, who has made a career out of ignoring evidence, suggests that everyone else should pay attention to this “evidence” and change their behavior. Not so funny is my role as Cassandra: If we start touting misleading studies like this one as being great news when they happen to go our way, it is pretty much guaranteed to hurt us rather than help us. Of course, Glantz does not have the skills to figure out that this study is flawed. But he might have had some hope had he actually read it. Or the press release. Or even one of the news stories. Instead, it is appears that he just heard some garbled sentence or two about it and wrote his post based on that. How can we know that? Because when his post first appeared (screenshot below), it described the comparison as between nicotine gum and e-cigarettes, even though someone who actually spent three minutes studying the material would not have made that mistake. Oops. That’s what happens when you don’t do the reading. And this is what happens when you don’t know how to operate your software. Notice now the first sentence is changed but the headline is still the same. Did he just not realize he needed to fix that too, or did he have no idea how to change a title on his blog and was desperately calling tech support to try to get them to help hide his error. Apparently tech support came through, though, because the version you will see if you follow the above link has memory-holed the evidence suggesting he did not even read the study (though you will notice that the link I gave still has “gum” in the URL, but now redirects to the new page where the URL has “patch” in it). So that is all quite hilarious. But don’t let it distract you from the main message. We need to focus on the real sources of knowledge about THR and not buy into a research paradigm that is — often literally — designed to hide THR’s clear successes and benefits. When e-cigarette advocates embrace studies with bad methods and misleading results (even if they seem to be “good” results), rather than objecting to the bad approach, it hurts the cause. In this case, even the “good” study can be spun against the truth about THR. As you have probably already heard, a new clinical study reported in the Lancet found that in the artificial context of a smoking-cessation clinic — using the very odd population of people who go to such clinics — when people were offered an inadequate [Update: possibly inadequate — see * footnote] quantity of low-quality e-cigarettes, they became abstinent from smoking (perhaps temporarily) at about the same rate as those offered nicotine patches. Woo hoo. I realize that some e-cigarette advocates have embraced it as good and exciting news, but I would suggest not getting too excited, for a few reasons. First, this study does not actually address the real-world phenomenon of THR. Real THR does not consist of shoving one particular option into the hands of people and saying “do this rather than smoking”. Even when that particular option might be ideal for some people (which seems not to be true in this case), it is not ideal for everyone. Imagine a hypothetical world in which one kind of e-cigarette was more satisfying than smoking for 10% of smokers, another kind for a different 10%, and snus for another 10% (and that no one else liked those products at all). In that scenario, we can help 30% of all smokers quit and also be happier for having done so. But any trial that tried to force one of those on people would show that it fails 90% of the time. So, a little bit of different random noise in their results, and e-cigarettes would have performed a bit below patches rather than a bit above them in terms of causing smoking abstinence. Had that occurred, this study would be making headlines as yet another reason to ban e-cigarettes. And instead of the press embargo being released after business hours on Friday (you are probably not aware, but the journal employed that classic tactic to minimize press coverage of an announcement) it would have been released on a Tuesday morning so it could headline all the health news sections that week. As I noted in the title, this time it worked out. But it next time it might not. And “worked out” is pretty faint praise in this case. Nicotine patches are a fairly worthless product. They work well for some never-smokers I know who use them for performance enhancement; they are pretty good for that because they deliver a constant dosage of nicotine, making them kind of like sipping coffee all day, which is perfect for some people. But history tells us they are pretty useless for quitting smoking (and you do not need any clinical trials to tell you that: in the USA, they have existed, they have been heavily touted, and yet smoking rates have basically just tracked the uptake of low-risk alternatives — enough said). Indeed, the claim that e-cigarettes merely worked just as well as patches (or even a little better) is flatly contrary to everything we know about e-cigarettes and how well they work. This story does not provide further evidence that e-cigarettes work; it implies that they do not work as well as we know they do! Instead of interpreting the study as important news, it is more useful to view the interpretations of the results as misguided science. That avoids the problem of buying into a bad scientific paradigm that is ultimately bad for THR. This is exactly the junk-science interpretation of what constitutes evidence that has been used to deny the overwhelming evidence about THR for the last decade. Yes, it is nice to be able to respond to those who play this game by saying “ha, we have a study too” — but it is just one and it is a pretty weak result. Better to focus on fighting the ANTZ’s repeated denial that other evidence is what is useful, which becomes harder if we implicitly endorse the denial when it is convenient. People who might be happy with a nicotine patch are not the target for e-cigarettes. Even less so are those who go to a clinic looking for some magic bullet that will make them not want to smoke (see my series on second-order preferences to understand what they really want and why they are never going to get it). E-cigarettes work best for the large portion of smokers who have become comfortable with (or resigned to) the fact that they want to keep smoking — or, of course, to do something that is a fully-satisfying substitute. And all this is to say nothing of the fact that the study report makes clear that the smokers were not given nearly enough e-cigarettes to provide an acceptable substitute (thus intentionally and inappropriately imitating the inadequacy of the patch) and the products were of such low quality that they kept failing. That is, the study was not a very good picture of what would happen in a clinical setting if you were really trying to get people to switch to e-cigarettes. We know that e-cigarettes are proving to be a popular and effective method for quitting smoking in the real world and that no serious short-term side-effects have been found based on millions of observations. We do not know specifically how well e-cigarettes would work in clinical smoking-cessation setting, though the reasonable hypothesis would be “they would work better than the current practice”. This study confirms, as we already had every reason to believe, that even with really lousy products, e-cigarettes are better liked than nicotine patches. This suggests (again, as we already pretty much knew) that clinics that really want people to quit smoking should start offering e-cigarettes. I hate to give the authors a hard time, because they were just doing their jobs as institutionally-constrained researchers (“must use hammer, so call everything a nail”), and were being vaguely pro-THR (though not so much as to risk offending the tobacco control industry, of course). Most of the blatant lies about this study are concentrated in the press release (and thus in the news reports) which the study authors did not write. However, if they had veto power over the content, as is likely the case, they share the blame. Ok, fine, it is the first of those. Yawn. I guess there are some bit of literal truth to be found there, but the overall message is very misleading. The reader is led to believe that this study tells us something new by conveniently ignoring the absolutely enormous quantity of evidence we have from sources other than trials. They might as well be saying “this is the first research done in New Zealand on this topic”. It is also false that the previous clinical trial (presumably referring to the one by Polosa’s group, which found a lot of smokers who were not seeking to quit spontaneously switched to e-cigarettes), for all of its limitations, did not show e-cigarettes worked better than NRT products. Polosa’s result clearly demonstrated that e-cigarettes work better because we already knew how poorly NRT works. It did not matter than there was no comparison within the study — you do not have to show them both on the same map to conclude that New Zealand is further away from you than your corner pizza place, after all. The study is also the first to evaluate whether there are any adverse health effects associated with using e-cigarettes in a large (300+) group of people, and in real life, rather than a laboratory, situation. There is one useful bit of information in the study, though it is pretty buried: The subjects who were assigned to e-cigarettes (either with or without nicotine) were enormously more likely to recommend them to other smokers than those assigned the patch were to recommend that. No shock there, obviously. But it turns out that we know relatively little about exactly how the social marketing of e-cigarettes plays out. Unlike the rest of the results (which are mere weak confirmations of what we already knew) this could be useful new knowledge. Bottom line: The ivory-tower types need to do arcane artificial studies like this in order to advance their careers. Health science journals need to publish and tout them in order to try to claim that they are the source of knowledge and so people should buy what they are selling at an enormous profit. This does not mean that those of us who are interested in the truth should fall for their marketing. Much like the cigarette companies, they are trying to sell a product that has some benefits, but in this case is ultimately a poor choice compared to alternative methods of inquiry. Sadly, all but a small handful of the ivory-tower types refuse to soil their hands by actually getting to know real people, THR product users. They use them as study subjects, but they never talk to them, let alone read their blogs and Facebook posts. If they did, they would not overstate the value of studies like this. The real science about what is happening in the world definitively demonstrates the value and success of THR. If we put our faith in artificial studies, however, we are just as likely to get results that contradict what we know as support it. The CDC results were published in the agency’s newsletter/blog, Morbidity and Mortality Weekly Report and the lies were blasted out to the public via this press release. Any American who is still shocked to find that their government is lying to them is an idiot (I doubt I will insult even a single one of my readers by saying that), and yet many reporters tend to blindly transcribe what CDC says rather than, say, bothering to read beyond the headline to see that it is clear based on only what CDC themselves reported in their press release that the claims are lies. The second sneaky lie was listing “middle school” ahead of “high school” even though the results for the former are trivial. But it is scarier to imply that this is mostly about 12-year-olds and not 18-year-old high school students, isn’t it? The third lie in the headline requires a bit of numeracy and data that is right there in the press release. (This opens the question of whether our nation’s government’s top health officials are themselves innumerate.) The number that more than doubled is for “ever tried”. When your study population is 3/4 the same people from one observation to the next (as it the case with students who are in high school in 2012 compared to those in 2011), and the phenomenon you are studying is new enough that most of the trying is recent (as with e-cigarettes or whatever the latest offering McDonalds or Pepsico has added to their menu), then of course you are going to see a sharp increase in the number who have ever tried it. It is almost impossible to see a decrease, and moreover, if the exact same number tried for the first time each year, that would come close to doubling the number who had ever tried. You are with me there, right? An 11th grader, in 2011, who tried an e-cigarette in 10th grade is still part of the “ever tried” group when he is in 12th grade in 2012. If one of his classmates tried one for the first time in 11th grade, he joins his friend in the “ever tried” group in 2012. Though the rate of trying was the same for this two-person population each year, the “ever tried” statistic DOUBLED!!!! Scream it from the rooftops! Did I mention that CDC are lying to people? CDC apparently did not actually measure e-cigarette use. They could have, of course. Presumably they knew that the results would contradict the alarmist prohibitionist message they wanted to deliver, and so avoided the truth intentionally. Actual use is clearly trivial. If you actually wade though their breathless rhetoric to find information, you learn that 2.8% of high school students reporting trying an e-cigarette in the last month. How many are actually using them? If it is even as high as 1/10th of that, we are talking 0.3%. But, hey, if you report something like that people will not be worried. And worrying people is the goal. So stick with “doubled!!!!!”. Identifying the other important lies requires a bit of knowledge rather just the level of math that we can hope every subject of the studies learned many years ago. (Am I being too optimistic about the quality of our schools? Perhaps. But that is off-topic.) It turns out that almost all the e-cigarette triers had also tried cigarettes and indeed that almost 80% of them were “current smokers” (which, given CDC’s misuse of terms may be an overstatement of how much they actually smoke, though we do know that — unlike with e-cigarette trying (“hey, what is that? can I try a puff?”) — a large portion of those who puff a cigarette in a month are genuinely current smokers). So this means that it is quite conceivable that most of those kids who tried an e-cigarette were pursuing THR! That is, they consider themselves to be hooked on smoking and are seeking a low-risk alternative. But we can’t have that, can we? A comparatively minor point in the context of their more blatant lies, but still quite poisonous, is CDC converting their statistics (via the estimated size of the cohort they are studying) to “1.78 million” total students having tried e-cigarettes. This level of precision implies that they have their result estimated so precisely that they know it to 1 part in 1000. But their trying statistics, even if about as right as they could possibly be have precision in the range of maybe +/-20% at best. (That is the best case scenario — when someone is lying about their statistics, always be concerned that they are lying about the data quality too.) If they had said “almost 2 million” that would be reasonable, but even rounding to 1.8 million would imply more precision than they actually have, let alone 1.78. Another comparatively minor but not trivial point is that quite a few high school students are of legal age to use tobacco products, and so it would be useful to break out the statistics for under-18 (which, of course, would be lower than those that include the 18- and even 19-year-olds). It is also worth noting something that we know but apparently CDC does not: Not all e-cigarettes even have nicotine in them. How many of the kids tried e-cigarettes with nicotine? No one knows. Of course, the biggest lie is the “gateway” lie. You know that when prohibitionists start making claims about a gateway that they have given up on pretending that a behavior is a problem in itself. So they have to make up some reason for prohibiting it, so they claim that it leads to something that is a problem. There is never any evidence to support those claims, about anything, as far as I have ever observed. That is certainly the case here. And yet the CDC makes claims that their data show that we should be worried about gateway effects even though there is no actual hint of that. You can tell someone is starting with a conclusion and fishing for claims to support it when they contradict themselves over it within a few thousand words. They claim both that the statistics showing almost all e-cigarette triers are smokers (or have tried cigarettes) suggests that there is a worry of a gateway and also that the statistics showing that a few (1/5th) of the (very few) younger kids who tried e-cigarettes had not tried cigarettes means that there might be a gateway. So, guys, what would the evidence need to show to refute the claim there is a gateway? The answer, of course, is that whatever the evidence shows, it supports the claim — this is religion, not science.